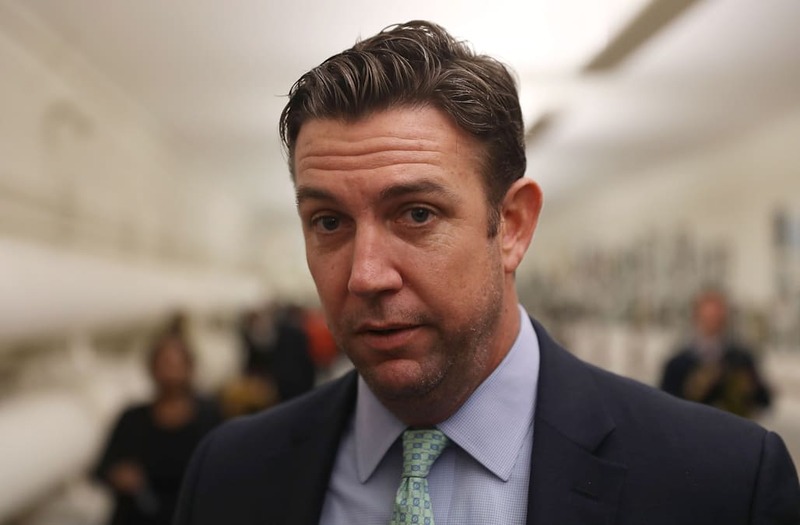 Rep. Duncan Hunter (R-Calif.) allegedly spent campaign cash on affairs with five separate individuals, according to prosecutors who reportedly claim to have photographic evidence. Hunter and his wife, Margaret, were indicted last month on 60 charges related to the alleged misuse of $250,000 in campaign funds for personal expenses such as lavish vacations and dinners. The couple has pleaded not guilty. The San Diego Union-Tribune is now reporting that the 47-page charging document alleges that the congressman had “personal relationships” with at least five individuals, none of whom are identified. Hunter’s lawyer, Gregory Vega, objected to that part of the investigation in an August letter to the Justice Department, the paper reported. Vega argued that prosecutors are pursuing criminal charges for conduct that falls into gray areas of civil election law. Vega claimed that the prosecutors told him they had photos of Hunter’s alleged affairs. Even so, he said, the indiscretions didn’t rise to the level of a crime. The alleged affairs are the latest piece of evidence suggesting that Hunter may not be the family values candidate he claims to be on his website. He also may not be the best husband. After Hunter and his wife were indicted last month, he told Fox News she handled all the family money and, therefore, the scandal was her fault. Hunter’s trial is scheduled for Nov. 24 ― 18 days after Election Day. Despite the criminal charges, the most recent poll by KGTV/Survey USA shows Hunter 8 percentage points ahead of his Democratic challenger, Ammar Campa-Najjar.